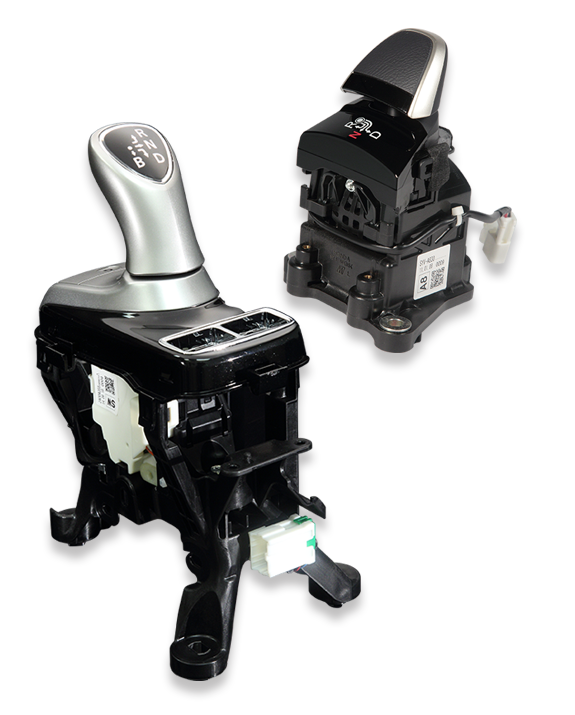 Ada Technologies is an accomplished manufacturer of transmission shift levers – automatic and manual with mass production experience at our corporate headquarters – Atsumitec – in new shift by wire technology. Automatic transmission select levers include floor type, in-panel type and column type; while manual shift levers include both floor and in-panel types. Contact Us Today for more information on shifter solutions – we deliver world-class quality in a timely manner. Ada Technologies has over forty years experience in the design and manufacture of Automatic Transmission Shift Levers. As part of the Atsumitec Group, our automatic shifter architecture incorporates a compact design – both a lightweight and flexible solution, along with a cost-effective product application. We are experts in the field. As a Change Control System Manufacturer, we have the ability to develop a comprehensive shift feel and function – using our vast knowledge of the vehicles transmission and related control parts for the optimum driver’s sensory experience – thus improving the quality and enjoyment associated with shift dynamics. 100% of our automatic shifter development is performed at our R & D Headquarters in Hamamatsu, Japan. Our development process begins by selecting the right material, with an emphasis on functionality, preliminary design study, and implementation verification. If a concern is identified during these initial design processes, we partner with our customer, our valued supplier and the concept is adjusted. Mating the shift dynamics to the vehicle style and design intent is paramount to the critical success of both our OEM customer and ADA Technologies. Our unique tools and analysis system enables us to bring the desired shift feeling to life. Through virtual simulation and detailed analysis, we can confirm this dynamic shift feeling without costly prototypes and time-consuming trial and error. We are a development oriented company. 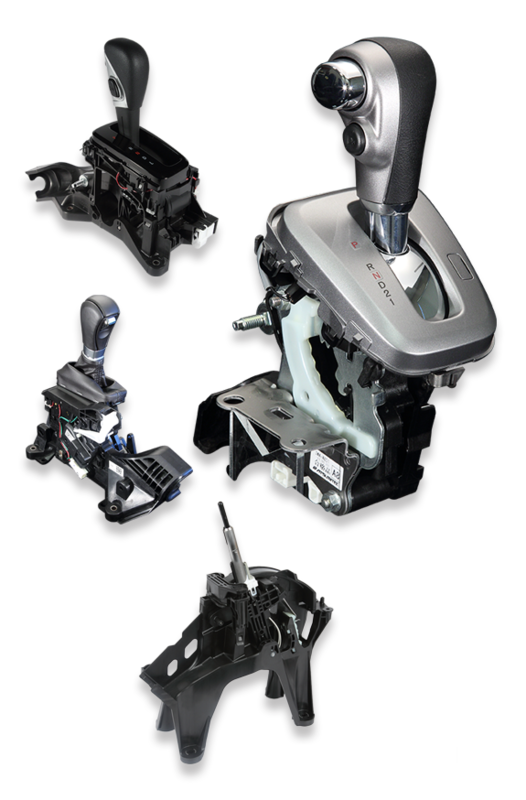 ADA Technologies has the experience and capability to develop a wide-array of automatic transmission shifters such as floor-type, in-panel type and column-type, along with a full range of shift patterns, including gate and straight shift types. Our dedicated development team’s responsibility is to propose a product which optimizes safety, quality, cost and timely development to meet our customers’ most demanding requirements. We have the knowledge, experience, facilities and competence to meet your functionality, weight and interior spacing specifications. Ada Technologies provides manual transmission change levers with premium qualities. 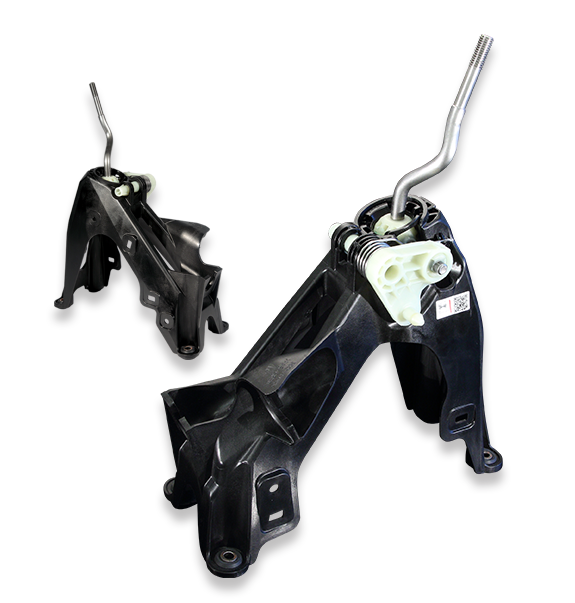 Our manual transmission change levers are manufactured and distributed to global OEM customers and include both floor type and in-panel type. We offer manual transmission change levers with reverse lock functionality. As a worldwide leader in manual transmission change lever design and manufacturing, we deliver efficient shifting comfort of the highest level to the driver. Exceptional shift comfort, low operating forces along with short and precise shift paths. The driver experiences shifting both comfortably and efficiently. Our manual change lever designs have a foundation originating with a compact construction, along with strategic weight reduction and a proven lightweight design. Optimally coordinated with OEM spacing and carefully synchronized with the customer’s manufacturing location. 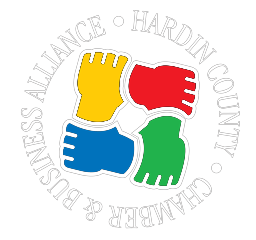 We are continually working to develop products with lighter weight and competitive costs for our customers. You can rest assured that Ada Technologies provides full cost controls from modular conception to a carefully planned delivery. Contact us today for more information on manual change lever solutions – we delivery world-class quality in a timely manner. As a global market leader in Change Control System Assemblies, ADA Technologies and our Headquarters (Atsumitec) are creating new value in the development, production and global distribution of gearshift systems with electronic signal transmission. Shift by Wire (SBW) is the leading-edge gear selection system without any mechanical union between select lever and transmission. The select lever makes use of multiple sensors to send signals to control the vehicle. This advanced technology part reduces the weight, by nearly half, of traditional mechanical type shifters, and allows the maximum use of the allowable interior space required. This ergonomic advantage allows OEM design autonomy and positioning within the passenger compartment. Atsumitec has mass production experience, as a Tier 1 supplier, for Shift by Wire. As a global leader in the design and manufacture of change control system assemblies, the Atsumitec Group provides in excess of 1 million shifters annually. Our quality, reliability and expertise are a result of over 20 years of production experience. We can accommodate Shift by Wire products with ECU and those designs without ECU. Additionally, our global manufacturing locations allow us to deliver product from multiple regions to support localized cost benefits. Evolvement through knowledge. Our mission is to deliver an innovative and integrated solution to our customer requirements. Contact Us Today to learn more about our shift by wire solutions – we deliver world-class quality in a timely manner.